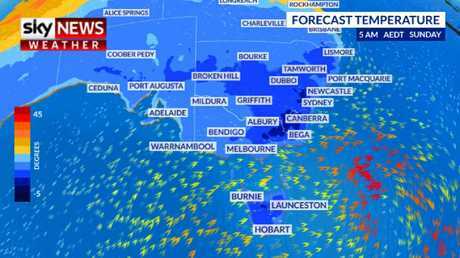 A cold outbreak is set to sweep across southern Australia this weekend. Picture: Sky News Weather. In some areas the mercury will struggle to get into double digits as an "unseasonably strong" cold front rattles through, leading to the chilliest weekend since November. A large swath of Australia could be affected from Adelaide to Sydney via Melbourne and Hobart. Meanwhile, further north, epic amounts of rain have been falling on Queensland. 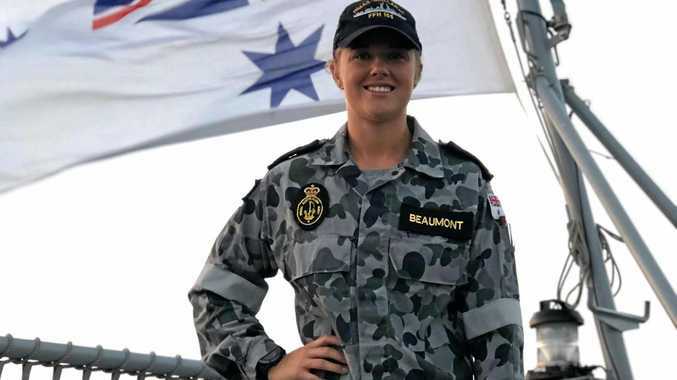 One community has seen its heaviest rain since records began as the remnants of Cyclone Trevor turn the sunshine state into the soggy state. 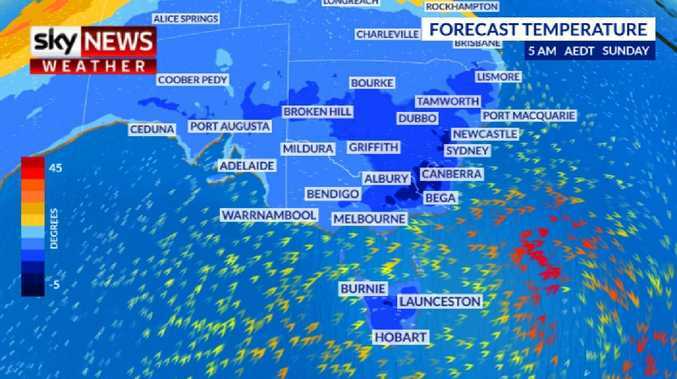 "The front will hit South Australia and western and central Victoria on Friday and Saturday, and then it will sweep into New South Wales all the way up to the mid north coast," Sky News Weather channel meteorologist Tom Saunders told news.com.au. On Saturday, Melbourne will drop to just 9C, while even during the day the city will be lucky to get to a maximum of 15C - that's a full 9 degrees below the March average. Inland, it's even more bracing. Ballarat will be 10 below average at 13C; overnight on Saturday the temperature could sink to just 4C. Up in the mountains, expect snow and temperatures below freezing during the early mornings. Mount Hotham will go from a daytime high of 11C on Friday to a maximum of just 4C on Saturday and then -1C early on Sunday. "The cause is an unseasonably strong cold front coming through. We don't usually see cold fronts this strong during autumn. This weather pattern is more typical of winter," said Mr Saunders. Temperatures that low haven't been seen in much of Victoria since November. It's not just Victoria. While not as chilly in Adelaide, temperatures there will drop from a very pleasant 27C on Thursday to 18C on Saturday, some eight degrees cooler than the norm. Heading into next week expect cold mornings of just 12C. 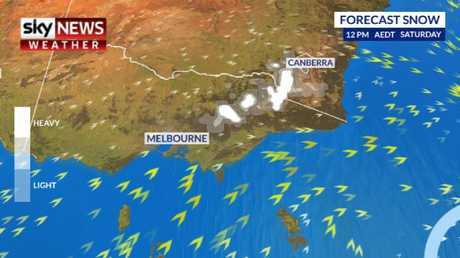 Canberra is set to sink from the mid-20s this week to high teens on the weekend, with a low of only 4C overnight on Sunday. Sydney will also see a reduction in temperatures. But it will be less extreme and will take the city from an above average 28C on Thursday to the March standard of 24C on Saturday and a low of 13C. "That's would be easily the coldest morning of the year so far," said Mr Saunders. Not content with rugging up due to one cold front, Tassie will get two. That will keep the mercury down in Hobart to around 15C for the weekend and into next week, with lows around 8-9C. Snow can be expected in the highlands. If you're not of the fan of the cold, however, don't despair. "Cold fronts are always temporary at this time of year. By Tuesday, temperatures will be back to normal," said Mr Saunders. Although it's a reminder that winter is indeed coming. North of the Tweed, the rain rather than the chill is focusing minds as ex-Tropical Cyclone Trevor brings masses of moisture across the state. "The whole state essentially can expect at least 25mm of rain; 60 per cent of Queensland will see more than 50mm, with many places well above that," said Mr Saunders. Blackall, near Longreach, picked up more than 131mm of moisture in the 24 hours to Wednesday morning - that's the heaviest rain in 25 years. The Trepell mining community, south of Cloncurry, recorded 176mm of rain - its wettest day since records began in 2001. Brisbane will experience the tail end of Trevor and could see up to 65mm of rain going into the weekend, with temperatures around the 30C mark. As you head up the coast, it's only going to get wetter. Rain is forecast in Darwin and temperatures around 33C, but the city should get a break from the wet over the coming days. Western Australia is finally getting some relief to be able to clear up after the chaos caused by ex-Tropical Cyclone Veronica. No rain is forecast for Karratha, but Exmouth could see a storm here or there. It will be sunny, warm and dry in Perth, with highs of around 30C and, potentially, as high as 34C on the weekend.